Cleveland. The call for cookies went out and the elves got to work measuring, shaking and pressing love into their work. 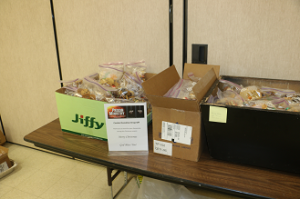 Their response was overwhelming – 300 dozen homemade cookies (that’s 3600 individual cookies! ) were baked up within a few days. There were snicker doodles, chocolate chip, peanut butter, sugar cookies, little cake balls, buckeyes and chocolate dollops to name a few. There were cookies with spirals, cookies with sprinkles, cookies with nuts, cookies with raisons and cookies to satisfy the choosiest palate. (The only thing missing were cookies with no calories!) 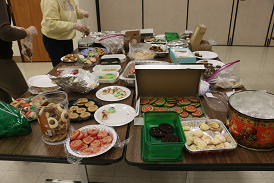 The quantity of cookies was only out down by the vast diversity of the offering. It was obvious these elves took the challenge to heart by baking for the imprisoned as if they were baking for their own family. 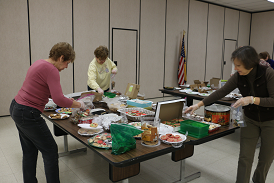 The exuberant packing elves dug into this mountain of cookies and using tremendous self restraint, made personal variety packs for those who couldn’t be with their family due to incarceration. Many hands make for short work and soon the Christmas Cookie Express was ready roll. A small group lead by Deacon John Travis met at the facility and got buzzed in by security who eyed the booty with some envy. The team was happy to share with the pleasant staff. Setting up in the kitchen area the “clients” began to file in slowly. Many brought their bibles and seemed more eager to hear the Word proclaimed than to actually get the cookies, while others took the preaching in stride as an ends to the cookie means. A short reading was giving and Deacon John gave an energetic and inspirational lesson on how the world is Satan’s domain and where he is definitely at work. Fortunately for us, a young girl said “yes” to God and brought our Savior into the world. God gave us freewill and he continues to ask our participation in doing His will. Our “yes” and our “no” have consequences; sometimes good and sometimes not so good. The past is behind us and we have all made mistake. Only our “yes” to follow the Lord is what’s important. When tempted – say “yes” to follow Jesus. When faced with a difficult life choice – say “yes” to live like Jesus. When wronged by someone else, say “yes” to respond like Jesus. Now is the time to say, “yes” to Jesus. The group was engaged with the Deacon’s message. Unlike the typical pew Catholic hearing a Sunday homily, this group would have stayed longer to absorb the Advent message of hope we on the outside take for granted. Unfortunately the room was needed for another event (lunch) so we had to move along. The grateful group lined up to grab a cookie bag. Some helped themselves to more than one but account of the over abundant generosity of the Christmas cookie elves there were more than enough to go around. Their joy was obvious. As you bite that Christmas cookie this holiday season, take a moment to thank God for times like this with friends and family. Then as you savor the cookie sweetness think of the love which went into its baking and remember the sweet love the Father has for all us – on both side of bars.